Lawrence Abu Hamdan is an artist, researcher, and private ear born in 1985 in Amman, Jordan and currently based in Beirut, Lebanon. In a few years he has achieved an expanded public due to his artistic and scientific research. He analyzes on the one hand surveillance technologies and forensic listening practices ( within legal hearings ) and on the other hand he focuses on language and phonetic comparisons of legal or political issues. In his audiovisual works listening is a concrete political technology, and the voice is the way to get to the legal truth. The voice in forensic linguistics is the only way to get to the truth. The example put out by the artist about unnecessary analysis on the accent of asylum seekers is an example of his criticism about the various gaps within legal forums where he finds a lot of incompetence related to listening and recording practices. These issues are mentioned in both the videos The Freedom of Speech Itself and The Whole Truth (2012). The first one is also the title of his first solo exhibition held in London where he explained through a 30 minute video different contemporary applications of forensic linguistics with a critic about the process of Ministry of Internal Affairs to check the accent of asylum seekers in order to identify their national origin. Recently, the same exhibition was presented as a sound installation with some vocal casts presenting the frequency and amplitude of two voices speaking the word “you”. In that case there was a cartographic technique based on the voice spectrum in order to represent both voice and territory notions, such as criticism of the legal discrepancy about the accent. Abu Hamdan is researcher and lecturer at Forensic Architecture (http://www.forensic-architecture.org), an agency affiliated to the Goldsmiths College in London that undertakes research projects about architecture and media on behalf of international prosecutors , organizations for human rights, political and environmental justice groups.. The agency is currently participating at the 15th International Architecture Exhibition (2016), organized by the Venice Biennale with an exhibition titled “Reporting from the Front”. His acoustic investigations and research about Forensic linguistics led him to work on a very controversial case. In May 2014 some Israeli soldiers in the occupied West Bank (Palestine) shot and killed two teenagers. The organization for human rights “Defense for Children International“ contacted Forensic Architecture, and the artist was asked to carry out an audio-ballistic analysis of the recorded gunshots to determine whether the soldiers had used rubber bullets, as they asserted, or had broken the law using real bullets. 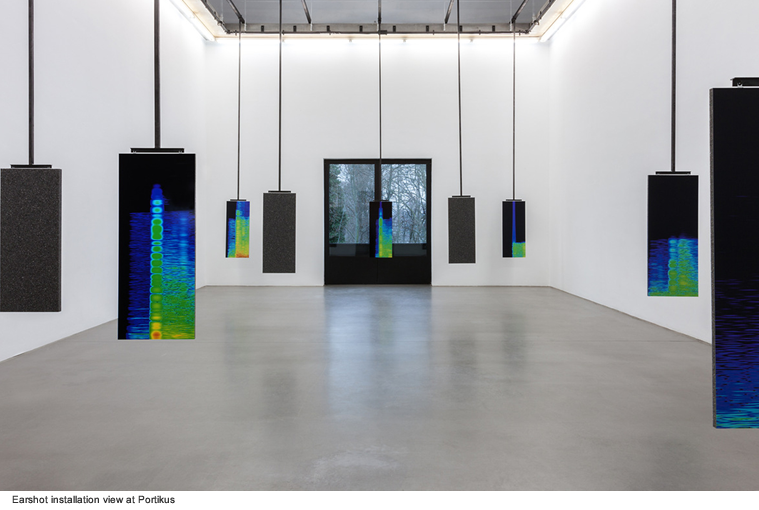 The exhibition “Earshot”, derived from this experience, was his first solo exhibition in Germany. The main part of this solo show was the video Rubber Coated Steel that presents the court and its victims, amplifying their silence, asking questions on how the rights are being heard today. 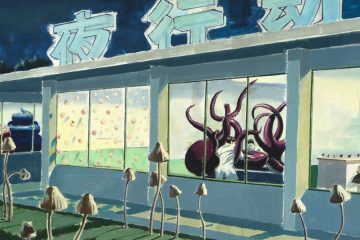 This video was also presented in Milan in April 2016, hosted by the Swiss Institute in collaboration with the library RIVIERA. 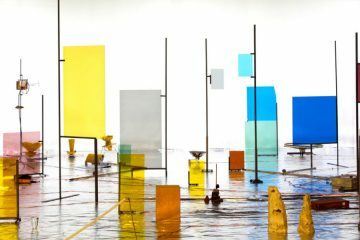 The work is currently installed at the Liverpool Biennial, which will end in October 2016. 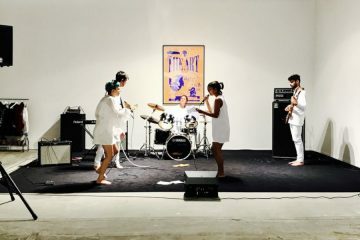 The ways Lawrence Abu Hamdan chooses to present his artistic research are different: performances, graphic works, photographs, Islamic sermons, compositions for music tapes, essays and lectures, and a variety of audiovisual installations including Convention of Tiny Movements (2011). This was a work commissioned by the Armory Show that simulates a future reality in which our relationships to objects and words are completely altered, as is the anxiety of being listened. The fact of being constantly heard turns in other projects into its opposite, in the practice of listening. In another installation of 2014, Tape Echo, he reflects on the act of listening as something that doesn’t seem to be a natural process linked to perception, but rather as a result of the space-time conditions of the contemporary world. The installation investigates the sound architecture of Cairo, taking into account the habit of its inhabitants to take their portable speakers through the streets of the city, building a personal sound space to get away from the noise of the noisiest city in the world. These multiple and personal sound spheres are producing a high sound density in the city. Abu Hamdan has developed Tape Echo through various elements such as Islamic sermons recorded on music tapes and used to record the sounds of the city, presented in three different sound installations with optical scans of the surfaces of the tapes, which are exploring, together, the evanescent traditional listening of sermons and seeking new sound dynamics of the city. Within his multiple spheres of action, Abu Hamdan manages to melt visual artist’s aesthetic and the practice of sound installations on a sound scientific basis, that probably aimed further than to an audience of collectors and art-experts sector: they raise awareness about the strong link between sound, listening, language and politics, in an age where the voice has become a stethoscope, susceptible to the careful analysis of the law, which aims to reveal the interiority of its subjects. His work has been exhibited in many solo shows: “The Freedom of Speech Itself” (2012) at The Showroom, London, UK; “The Whole Truth” (2012) at Casco, Utrecht, the Netherlands, “Tape Echo” (2013) at Beirut in Cairo, Egypt, and “Earshot” (2016) at Portikus, Frankfurt, Germany. 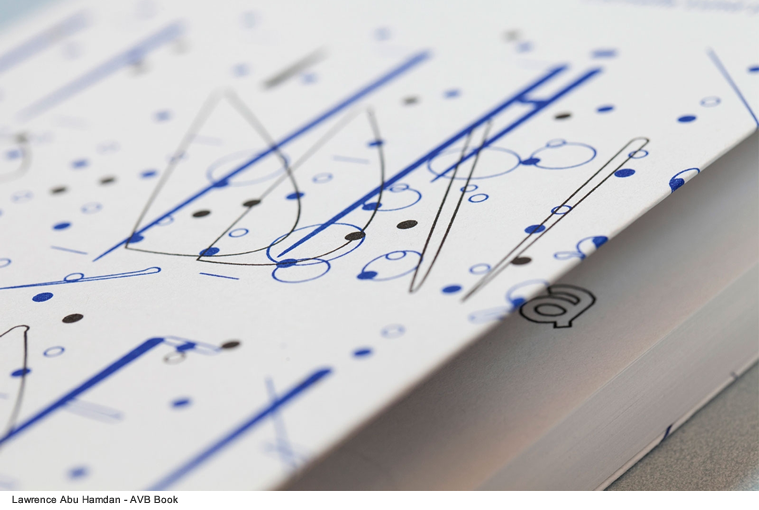 His works have been part of the group exhibitions “Word.Sound.Power” (2013), Tate Modern, London, UK; the touring show “Meeting Points 7” (2013–14), “Schizophonia” (2013–14), CAC La Synagogue de Delme, France, “Hacking Habitat” (2016), Utrecht, the Netherlands, “Voices outside the echo chamber” (2016) Framer Framed, Amsterdam, the Netherlands. He collaborates with the Centre for Research Architecture, led by Eval Weizman, at Goldsmiths College, London, UK. Lawrence Abu Hamdan’s practice has always been developed consistently around the notion of listening, and its various connotations. 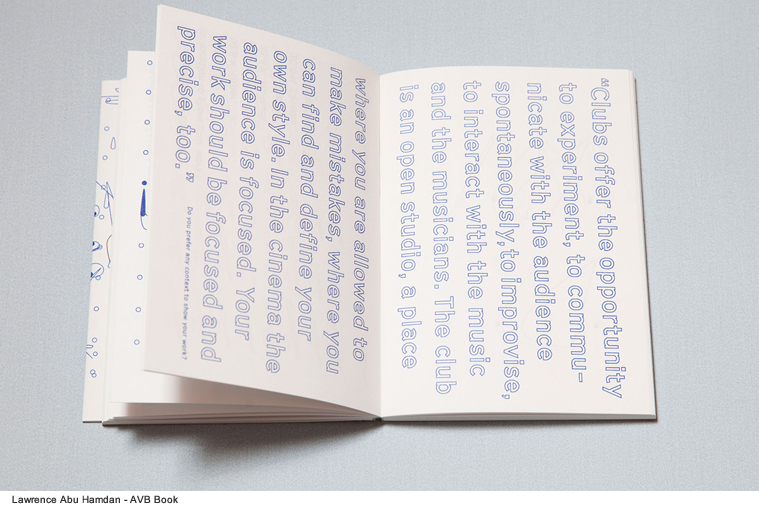 If in earlier works his investigation was directed more towards an exploration of the architectural space and how our sounding agency defines that very space, later his interest for sound mutated into an interest towards speech and voice as generative elements of specific modes of listening, leading also to a consideration of technology in terms of reappropriation and political implication. 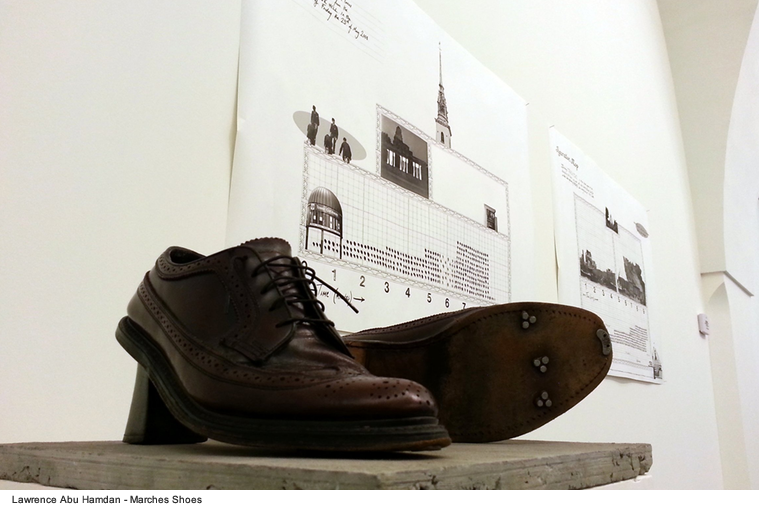 Lawrence’s older works, like Marches (2008), investigate the built environment, intervening performatively on it, in order to augment the perception of its aural qualities: architecture is treated “like dormant music, awakening […] through the act of walking”. This kind of work proposes a way of navigating specific spaces while declaring a presence which affects the environment. This presence is determined by the sound emitted by customized shoes, with heels and soles which produce loud sounds while stepping, and make those who wear them be in return affected by the reflection of the sound they produce. Marches transforms the soundscape into a space for presence, or, we could say, for representation; the leap towards the issue of spaces for voices and the analysis of these specific voices according to their role in politics was short. The transformation of his research focus happened while developing the project The Freedom of Speech itself, at Showroom London, 2012. This marked a turning point in Lawrence’s work, focusing more on specific spaces created for producing and listening to voices. The image of the court played a central role, implicating the notion and the agency of the voice in a juridical context. At Showroom the artist led and documented workshops in which participants were guided in the courtroom environment, by impersonating all the different roles present in it (the microphone, the typist, etc), exercising different modes of hearing as well as of enunciation. 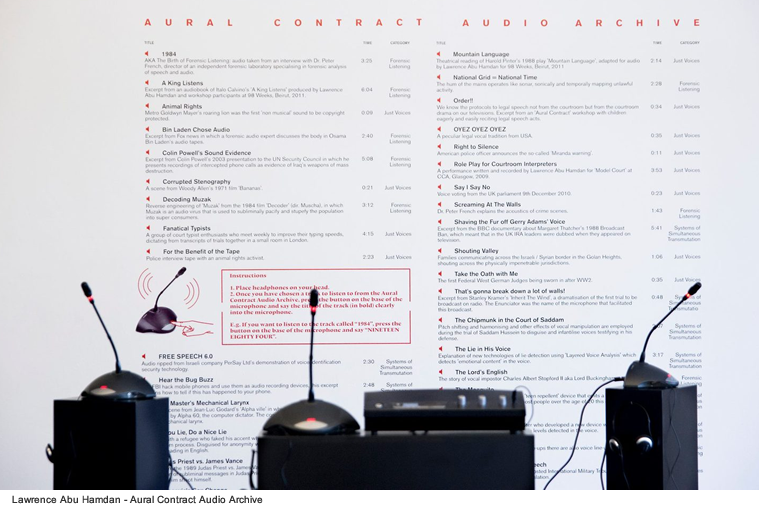 An ongoing project is Aural Contract, started in 2010, an audio archive which is activated through the Bosch Ultro Discussion System, a technological tool used in many courtrooms, including the UN Human Rights Council in Geneva as well as in the International Criminal Court in The Hague to amplify and transmit testimonies. 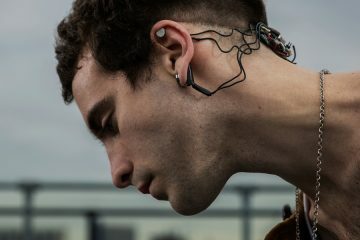 The device allows to listen to the testimonies collected by the artist in the same way they are produced and listened back in the very locations in which the System is present. In order to select and listen to the tracks available in the archive, the listener has to pronounce the title of the track of interest into the microphones. This means that the machine could also not recognize, hear, or better, “accept”, the requesting voice, and deny access to the archive. The courtroom becomes the symbolic space for the production of truth, happening through the enunciation of verdicts (etymologically: “truth/speech”), and where voices are being heard and judged through a series of rituals which rely mainly on the spoken word. These rituals make the “legally inaudible speech audible”, transforming language into testimony, and rendering the speech liable. A double duplicity unfolds from this very first simple acknowledgement: on the one hand the difference between the right to speak and the right to silence; on the other the idea that what is being heard is judged on a double level, what is being said and how the body produces that what is said. Lawrence defines the first as the “said” and the latter as the “saying”. In the first case the problem is that the freedom of speech is a human right, while the right to silence is not. This discrepancy uncovers the malady of an all-hearing and all-speaking society, in which we are compelled to always express ourselves, because when we don’t we draw suspicions, our silences might automatically imply that we are hiding something, therefore making us liable of being identified as a threat to democracy. What it is important to underline then in the second duplicity mentioned above is the idea that if on one level the speech, the testimony, is based on the content uttered by the person who bears witness, on another level the voice in itself becomes liable, regardless of what it is saying. In a sense the body who testifies splits into two selves, extending that notion of “testis unis, testis nullus” which implies that only one testimony cannot be considered valid if not corroborated or nullified by at least another one. This interest on the duplicity of the voice as a producer of speech and, while producing speech, also generating different modes of listening, led Lawrence to different projects, among them: ContraDiction: speech against itself and Conflicted phonemes (2012). ContraDiction (2014) is a “live audio essay” that tackles the issue of duplicity of speech by analyzing the notion of Taqqiya, a piece of islamic jurisdiction practiced by esoteric minorities, which allows believers to hide or deny one’s own faith, or even commit criminal acts, under conditions of persecution or statelessness. Abu Hamdan’s analysis of Taqqiya stems from the observation of video documentations of alleged mass conversions of the Druze communities in northern Syria at the end of December 2013, intertwining these stories with the identification and examination of a typical Druze tradition. This tradition, Taqqiya, is about learning how to pronounce all the arabic phonemes perfectly, thereby creating the conditions of mystifying truth within the very modes of pronunciation, and offering a way of hiding silence into speech. Druze, as Abu Hamdan explains in one of his live audio essays, is a kind of esoteric faith expressed privately, not in mosques, and the cohesive activity of this community is maintained through the complex and ambiguous practice of legal dispensation and dissimulation offered by the Taqqiya. Taqqiya implies the adaptation of the speech to the kind of listener one is talking to, it is a vocal practice which pushes language (as content) to the background, making the respect for words, and for the truth of language, hence of pronunciation, become a mode of identification. If the phonetic pronunciation of certain words is not correct, then the truth is not being spoken, and Taqqiya is taking place, hiding the believers under the shield of language as well as creating an inherent contradiction between what is said and how it is being said. In the case of Conflicted Phonemes the analysis of the voice takes place in relation to a specific sociopolitical situation, that of migration. Asylum seekers are being granted or refused their requests according to their accents. In this case the voice in itself, as an object supposedly analyzable through objective parameters, collides with the bureaucratic idea of nation state, the very borders defining it, and the resulting notion of nationality. The methods applied for the accent recognition are not scientific at all, despite their claim to be, and they fail to acknowledge the palimpsestic qualities of the voices they analyze, that is: the layered and complex history of movements and contaminations a voice might have undergone during its life. A voice is then a biography of movements, not a static identification of national belonging. This applies even more to those people who live itinerant lives, and who are most of the times also obliged to hide their own accents for the sake of survival. Conflicted Phonemes exists as a series of maps which expose the relationships among accents, birthplaces, cultural exchanges, migrations, and the policies and technologies designed to assess these elements, trying to bind an accent, a voice, to a static category, a nationality. The concern about voice, together with the multiplication of devices which listen to us constantly, was backed up by a series of encounters and interviews of the artist with experts in voice analysis, sound propagation, and recorded media. The artist mentions one above all, Peter French, which embodies this contemporary practice of dissecting and analyzing voices as objects at the core of the juridical practice, as evidence, as testimony, as part of a ritual which relies on the fact that, in order to be effective, law has to “be announced and it must be heard”. 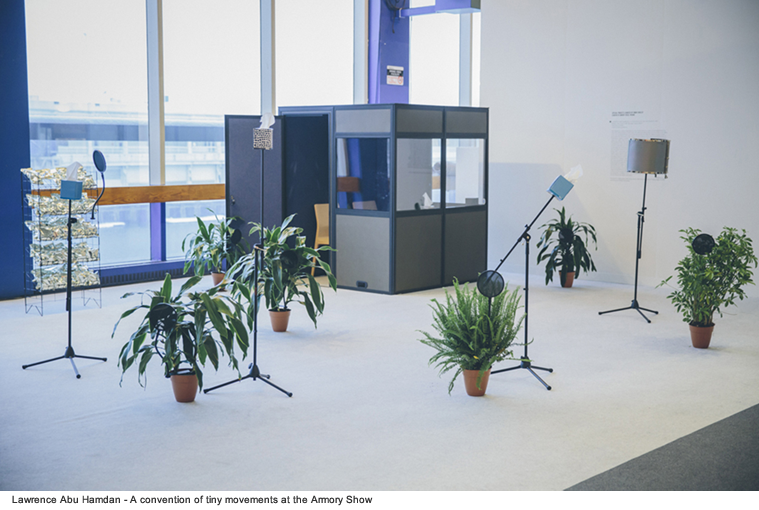 Not far from the topic of the voice, but touching also more closely the realm of soundscape and obsessive listening we can mention A convention of tiny movements, a project presented at the Armory Show 2015. It is a work which, according to the artists, shows what would possibly be the near future of listening. The starting point was a research developed at the MIT and that would allow the recording of spoken speeches through data captured by high speed cameras from vibrating objects. That means that when a specific material is brought to vibration by sound, it would be able to record that specific sound, as if it was a sort of visual microphone. It seems like a dystopian image for the future, but the take Lawrence has on this is based on the idea that such technologies should be appropriated by the general public, and developed also by it, instead of keeping the development and the use of them by the sole MIT in conversation with the NSA, for example. 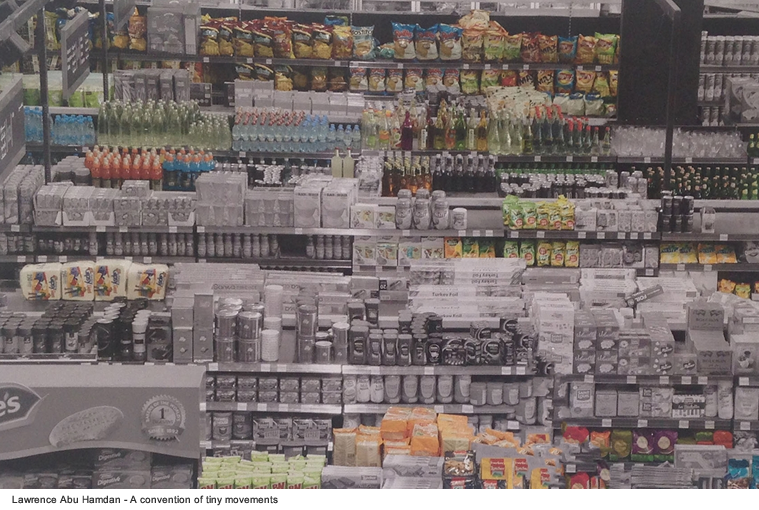 Part of this intervention at the Armory Show was a certain amount of bags of potato chips distributed during the fair, on which a text explained the research according to which, as we said, sound can be recovered from a certain material, rendering an unsuspected object compliant with the giant apparatus of listening and surveillance which surrounds us, especially in the context of an art fair, where speech and deals are made with whispering voices. In this state of constant surveillance, according to the artist, we don’t need to erase and destroy the tools used to listen to us. We should multiply them, and also use them to listen back to those who are hearing us, to then deploy them as tools for political intervention. In the current age total transparency is judged to be at the foundations of democracy, but we need to acknowledge that, even if our right to speak is still intact, the conditions under which we are being heard have changed. We need more listening, we need to listen back as well, because the truth which is being extrapolated by the recordings which concern us will always be somehow partial, and would fail to acknowledge important bits and pieces which would be necessary and crucial to make the truth complete, that is: layered and complex. The main example of this way of thinking is given by Rubber Coated Steel, a work presented – as said before – during the exhibition “Earshot”, at Portikus, Frankfurt, and now on view at the Liverpool Biennial. The case around which Rubber Coated Steel revolves is the murder of Nadeem Nawara and Mohamad Abu Daher by Israeli soldiers on the West Bank. 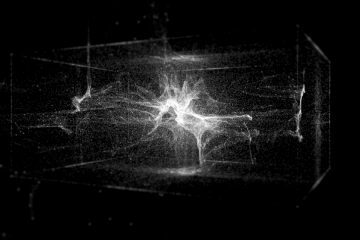 As previously described, after the murder, the organization Defence for Children International contacted Forensic Architecture, based in Goldsmiths, London, and of which the artist is part. The video presented in the exhibition is a silent one. The sounds from which the work has developed are evoked by the transcription of a courtroom interrogation, in which the forensic analysis of the gun shots is discussed. We do not hear any voice speaking, nor any sound, we just see visual material presented through a mechanism which resembles shooting ranges and which narrates a story while making clear the difference between the sound of a rubber bullet and the sound of a live ammunition disguised as a rubber bullet. Rubber coated steel, as the titles says. The layering of the construction of truth here is narratively deployed, matching images and written words. The silence we hear is the one which is not allowed in our contemporaneity, but also, as Lawrence told me quoting Edward Said, what is not being heard when it comes to represent or talk about peoples living in the Orient. Lawrence analyzed the sounds of the gunshots using programs available to anybody who produces music or deejays, putting in the background the notion of expertise, while bringing to the foreground the importance of repurposing tools we have at hand in the creative industries. 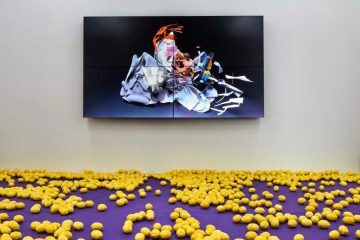 His way of investigating refuses the classic modes of critique, implicating himself into the story he is analyzing, and using the tools he has available, as well as his training as an artist, in order to produce an aesthetic outcome which collapses the question and the relationship between aesthetics and politics. For Abu Hamdan any aesthetic has a political impact and implications, as well as critical consequences. Aesthetics can produce narratives as well. In the case of Rubber Coated Steel, the work existed in the very beginning as a Human Rights report. When it then became a video the artist was able of saying all the things he could not express in an official report. The idea that emerges from the images of the video, the idea of the shots bearing a kind of truth, generate not only a critique of truth itself, but also of the notion of human rights. The installation operates as another kind of report, which is representing something very different from what the official written report does. Again Abu Hamdan: “In West Bank they were firing live ammunition, and both the kids were killed by live ammunitions. However, the soldiers covered and suppressed the sound of live ammunition by putting at the end of the rifle a rubber bullet adaptor. Visually, it looked like they were firing rubber bullets, and also sonically, it sounded like they were firing rubber bullets, except for a specific detail: the shots actually broke the sound barrier, there’s a crack, an high pitched crack that isn’t there when a rubber bullet is fired. To my surprise: the sounds were neither of rubber coated steel bullets nor the sound of live ammunition, but something in between, a kind of amalgamation of the two sounds. These sounds, while being analyzed, taught me that the question is not about the use of lethal weapons versus the use of non lethal weapons, but it is a question of how the idea of non lethal violence really allows for the most brutal types of violence to emerge. The argument was moved against rubber bullets, because the international law allows to fire them, which then provides also an alibi for the use of live ammunition by just slipping in the guns real bullets. And then it’s there: that very tiny crack sound, from which all kinds of politics unfold. It was very difficult for me to hear it, I really couldn’t hear it. I could only see a difference when visualizing the sounds. 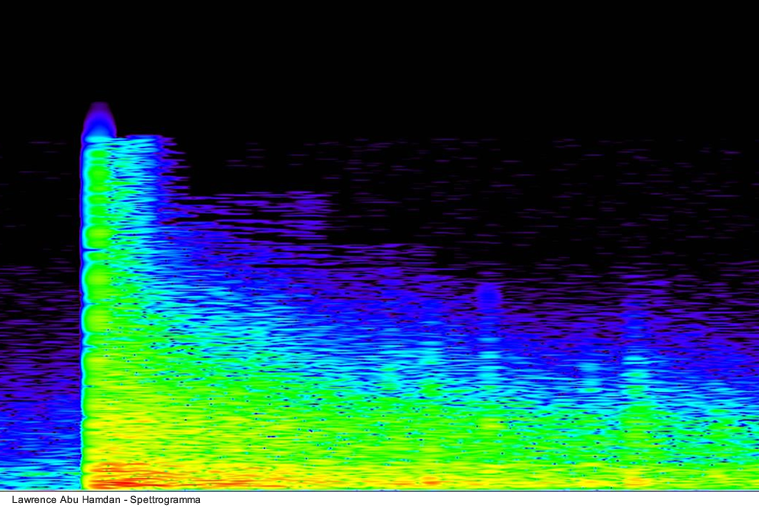 This is why I produced spectrograms. In terms of aesthetics it is interesting to notice how what I couldn’t hear was then only possible to hear through sight. And to come back to the idea of expertise: the real experts are those kids on the ground, who can hear the second soldiers start firing what kind of gunfire and what kind of ammunition it is. They can forensically tell from the sound itself; those people, subjected to those sounds on a daily basis, are the real experts. Their apt listening is a strategy of survival as well. However, the very fact that these sounds came to visibility was also important. Those were very strong images which would end up circulating much more than a sound could, they ended also on CNN. These bullet graphics were a way of communicating the event, and this happened outside the very question of expertise”. This also brings up the question of how an artist implicates himself in a work, and how he manages the political consequences of that very work. But for Lawrence the position of the artist is an important one, and he considers the white cube gallery space a very productive one, legally speaking, being it one of the last spaces where “you’re not liable, where your speech is not liable”. It is a space where the conditions of listening are being produced, facilitating specific ways in which sounds and voices are heard, reinventing and redefining what constitutes speech itself. It is another system of truth production, and Lawrence seems to be navigating all the different systems he encounters and deals with in a very conscious way. Abu Hamdan is also aware that truth is being produced, especially on the level of international law, from a very white male universe, having its ancestry in the universalist modern project which caused also colonialisms and genocides, among the others. The question of truth, of the legal truth, in all its contexts, is still a kind of colonizing agent, one of the major ways in which the Western colonialism persists not only in the Middle East, but in many other contexts. The truth producing formula is through witness testimony, confession, and oath, and it is applied to contexts in which perhaps other modalities of understanding and producing truth itself are being used. In an era when algorithmic listening and freedom of speech are “weaponized” and used against most people, we should think to what extent our ways of producing truth, and even legal truth, are still valid. Lawrence Abu Hamdan claims the space given by aesthetic practices to suggest ways of implicating ourselves into the subjects we criticize and contest, in order to regain that political agency that cannot be given back to us, but needs to be regained through the repurposing of the tools we have available. Language, in a faith whose sacred texts had been written in the idiom which is still currently spoken by the communities which practice it, is just another mode of existence of the world and not just a representation of it.